Rotator cuff problems are the most common cause of shoulder pain in people over the age of forty. What is the rotator cuff ? 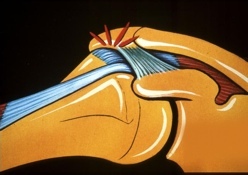 A tendon is the strong connective tissue which connects a muscle to bone. 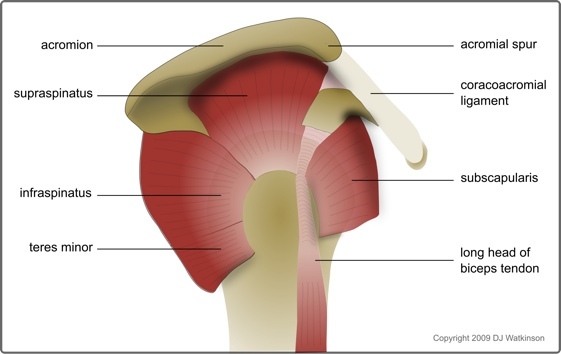 The rotator cuff is a group of four tendons which surround the shoulder on three sides. They are flat tendons which all blend together, producing a cuff of tissue enclosing the shoulder joint on the back, the top, and the front. These tendons are (starting from the back), the teres minor, the infraspinatus, the supraspinatus, and the subscapularis. The cuff tendons act a bit like guy-ropes, stabilising the shoulder joint and also helping to initiate and control shoulder movements. The muscles attached to these tendons are relatively small and are best thought of as core-stability muscles. They therefore play a very different role to the larger muscles on the outside of the shoulder, particularly the deltoid muscle, which are responsible for power. In a normal healthy shoulder, the rotator cuff and the deltoid act together to produce strong and fluid shoulder movements. However if the cuff is weak or damaged, then shoulder movements can become weak and painful. Unfortunately this is a common problem, particularly as one approaches middle age and beyond. Why do rotator cuff problems happen? There are two main causes of rotator cuff problems: subacromial impingement and tendonopathy (tendon degeneration or wear and tear). Symptoms may be precipitated by an injury, but the amount of trauma involved can be quite mild if the tendon has already been weakened. The rotator cuff tendons, and particularly the supraspinatus tendon travel in a space under the acromion. This is the shelf of bone which you can feel on the top of your shoulder. The powerful deltoid muscle which gives your shoulder its contour arrises from the acromion. The gap beneath the acromion, the subacromial space, is quite narrow, even in a normal shoulder. However if there is any thickening of the tendon because of inflammation or degeneration, then this space is narrower still. On top of this, a bony spur can occur on the under-surface of the acromion. All of this can cause the rotator cuff to become squeezed as it passes under the acromion as the arm is lifted forwards or to the side. This is called subacromial impingement and is a common cause of shoulder pain. What are the symptoms of subacromial impingement? Subacromial impingement causes pain on the outside of the shoulder in the so called epaulette area. This pain may radiate down the side of the arm towards the elbow. The pain is typically worse with activity and particularly when using the arm overhead. The pain is generally eased by rest and by simple or anti-inflammatory pain-killers. How do you treat subacromial impingement? This depends on the severity and duration of symptoms. Initial treatment involves rest and pain-killers. If symptoms persist then it is important to seek medical advice to confirm the diagnosis and consider further treatments. Your doctor may order an ultrasound or MRI to rule out a rotator cuff tear, and an x-ray to look for any bone or joint problems. A subacromial steroid injection may help to reduce the pain, but it is important to combine this with physiotherapy as the effects of the injection are often relatively short-lived. Physiotherapy usually involves excercises to strengthen the rest of the rotator cuff in order to take the strain off the supraspinatus tendon. If symptoms persist despite these measures, then surgery may be considered to decompress the subacromial space. This is called an arthroscopic subacromial decompression (ASD). The aim is to remove any inflamed tissue or bony spurs which are narrowing the subacromial space, and to bevel the undersurface of the acromion in order to create more space for the rotator cuff. This is a keyhole operation which can usually be performed as a day-case. Tendinopathy is the degenerative condition which affects many tendons around our body as we get older. This commonly starts around the age of forty. The degenerate tendons are weaker and less elastic than healthy tendons and are therefore less able to withstand trauma and repair themselves. As the strength of the tendon deteriorates, it becomes more prone to tearing, sometimes with minimal or even no trauma. 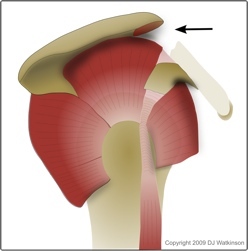 Rotator cuff tears may vary in extent from small partial thickness tears (which don’t go all the way through the tendon), to large full thickness tears involving several of the cuff tendons. Cuff tendinopathy causes very similar symptoms to subacromial impingement, and is often the underlying cause of the problem. This is because as mentioned above, the main role of the rotator cuff is to stabilise the shoulder joint. If the rotator cuff is weak, the power muscles can tend to pull the shoulder upwards at the same time as they lift the arm, thus further narrowing the subacromial space. Physiotherapy to strengthen the rotator cuff is therefore often recommended as first-line treatment for tendinopathy and subacromial impingement.